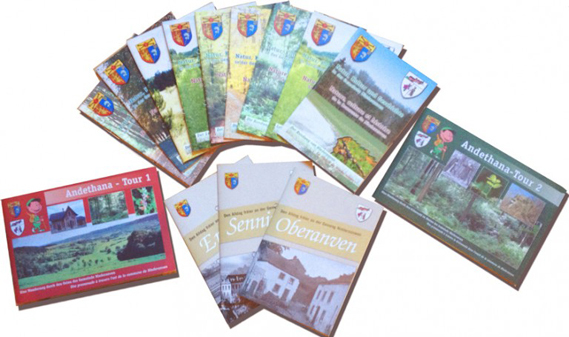 In all these local­i­ties, the Munic­i­pal Admin­is­tra­tion, in asso­ci­a­tion with the Tourist office and the “Geschichts­frëmm” (Friends of the local his­to­ry), fit­ted out the­mat­ic trails and drawed up infor­ma­tion boards with the aim of mak­ing bet­ter known to the vis­i­tors and to the cit­i­zens of the munic­i­pal­i­ty the char­ac­ter­is­tics of the nature, the cul­ture and the his­to­ry. Numer­ous brochures have been pub­lished to the dif­fer­ent the­mat­ic foot­paths. You can pur­chase them at the Town hall.